What follows is a reproduction of an article in the Scottish Marathon Club magazine of January 1984. Other bits and pieces will be added over time but for now we have ‘The Edinburgh to Glasgow Revisited’ by John Softley. 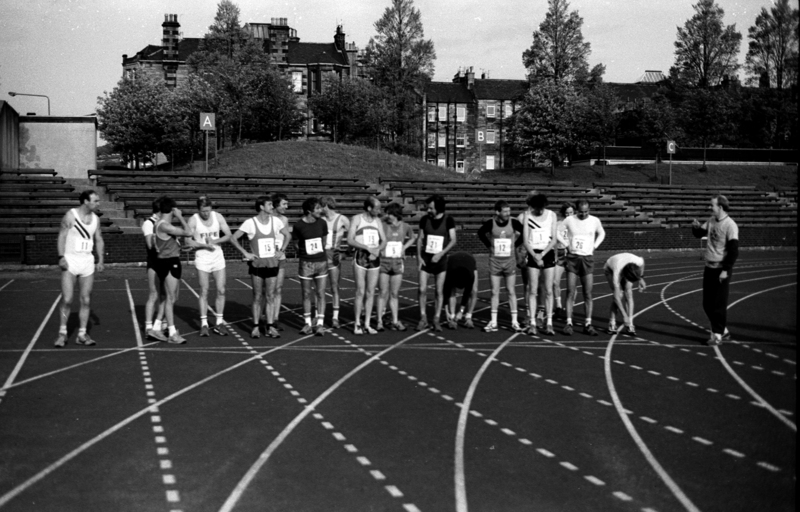 “Many will be unaware that an individual race took place between 1961 and 1972. the race was organised by the Scottish Marathon Club and was the Scottish equivalent of the Road Runners’ Club’s London to Brighton. There had been talk of holding a race in the late fifties. The subject was first raised (officially) by George King at a Committee Meeting on 16th November 1959. At the next meeting on 15th February 1960 it was agreed to hold the race on 24th September 1960 with an 11:00 am start and a 10/- entry fee. Dunky Wright mentioned that professional races had been frequently contested in the twenties and early thirties. Times were not always recorded but to the best of his knowledge the record stood to A Ruthven of Conon Athletic and Sports Club with 5 hrs 54 mins 45 secs. in 1927. Unfortunately only five entries were received and much to everyone’s disappointment it was agreed to cancel the race. There was however a race the following year and despite a small regular entry was held every year up to 1972 when it was finally discontinued. The race is the least documented of all the SMC promotions and no race files exist. I am therefore most grateful to the following for supplying results and reminiscences. 1961-63: George King 1968-70: Bill Stoddart 1971: Alex Wight. 1961: The first race held on 14th October was well organised. G Stott (Smethwich Harriers) one of the four English entrants won in the record time of 5h 23m 23s. There were only three finishers from 10 starters and all were inside the previous record. The winner was up with the leaders throughout and after H Mitchell (Shettleston Harriers) had led up to the half distance, Stott took command being timed at 4h 5m at 36 miles and 4h 43m at 40 miles. His only previous appearance in Scotland was at the Gourock 14 in 1958 when he finished last. 1962: The second race held on 20th October attracted 15 starters – 10 Englishmen and 5 Scots. From the start Arthur Mail (Derby and County) took the lead closely followed by John Barber. After three miles Mail was joined by Andy Fleming (Cambuslang) with Barber and last year’s winner Geoff Stott. The leaders remained unchanged until 15 miles when Laurie Liles and David McDonald (Haltemprice) joined Mail with Fleming and the others dropping back. At 20 miles Liles and Mail were together in 2:02 with Barber third in 2:02:20. By 30 miles Mail had forged ahead to a 4 minute lead (3:09:00) over Barber with Liles in third in 3:13:07. Mail passed 40 miles in 4:21:00 with Liles second after Barber had retired at 38 miles with stomach trouble. Mail finished very strongly recording 31 minutes for the last five miles and breaking the record by no less than 31:17. The first four were all within the 1961 record. 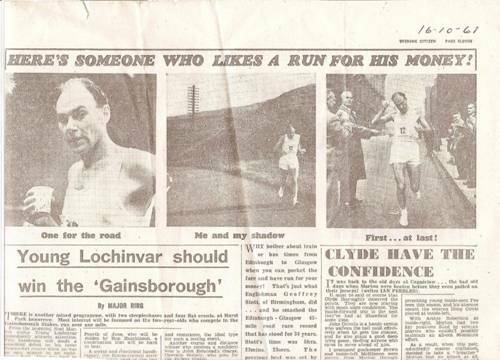 1963: “Eadie’s record against wind and rain.” Gordon Eadie (Cambuslang) a former Scottish Marathon Champion was the hero of the 15 starters for this year’s race and against heavy rain and strong winds registered the record time of 4:51:17. Eadie covered the last 10 miles in the splendid time of 70 minutes and finished extremely fresh. C Hallinan (Leigh) was second in 5:28:54 from G King (Wellpark) 5:32:47. Mail was fourth in 5:54:30, J Barber (Sutherland) was fifth 6:08:19 and M O’Neil (Leigh) sixth in 6:45:55. Leigh Harriers won the team race with 8 points. 1964: Winner G Eadie Cambuslang. 1965: 1. A Fleming (Cambuslang) 4:54:54; 2. H Mitchell (Shettleston) 4:47:43; 3. D McDonald (Haltemprice) 5:29:38; 4. W Kelly (Cambuslang). Team: Cambuslang 5 points. 1968: Hugh Mitchell (Shettleston) who does up to 180 miles per week in training won the annual road race held on 19th October for the second successive year in a new course record of 4:39:55. Bill Stoddart (Wellpark) took second place in 4:43:45 with the previous record holder Gordon Eadie in third place almost 21 minutes behind the winner. After 5 miles Mitchell and Stoddart led in 29:15 from Willie Russell (Monkland Harriers) in 29:31 but over the next 5 miles Russell caught the leaders. By 20 miles Russell had dropped back as Mitchell and Stoddart passed in 2:02:17. Russell retired at the marathon distance but it was not until 36 miles that Stoddart began to feel the strain and allow Mitchell to go well clear. Shettleston Harriers with two in the first four were easy team winners. First six placings: 1. H Mitchell 4:39:52; 2. W Stoddart 4:43:45; 3. G Eadie 5:00:51 4. J McDonald (Shettleston) 5:28:15; 5. D Turner (Pitreavie) 5:32:58; 6. K Mackay (Preston) 5:41:00. 1969: Bill Stoddart, the Scottish Marathon Champion was in top form on the 18th October when he won the annual 45 miles road race in 4:36:13. Stoddart took command from the start and by halfway was easily holding off the challenge of John Ballantyne (Springburn Harriers) and Hughie Mitchell, last year’s winner and course record holder. Passing the marathon distance in 2:40 he was more than 5 minutes clear. By 35 miles the race was virtually over, Stoddart having almost ten minutes in hand over the rapidly tiring Mitchell who in turn had shaken off Ballantyne. Finishing 3:42 inside Mitchell’s record and nearly 15 minutes ahead of his nearest challenger, Stoddart appears to be developing fine form in time for next year’s Commonwealth Games marathon. 1. W Stoddart 4:36:13; 2. H Mitchell 4:50:49; 3. J Ballantyne 5:15:10; 4. W Russell (Shettleston) 5:17:04; 5. G Stott (Warley) 5:57:19; 6. K Mackay (Preston) 6:05:06; 7. D Anderson (Wellpark) 6:11:01. As Russell was running as an individual, the team race went to Wellpark with 8 points. 1970: This year’s race was held on 17th October under wet and windy conditions and attracted 16 starters. Bill Stoddart repeated his success of a year ago by winning in 4:48:08. Plagued all season with a thigh injury that kept him out of the Commonwealth Games marathon he was determined to prove his fitness. Bill went straight into the lead and by 5 miles he was leading the field by 40 seconds. He stretched this to 7 minutes by 20 miles from Jimmy Milne (EAC). He kept going with the occasional sip of fruit juice and the odd cup of tea to win by more than 16 minutes at the finish. Shteeleston Harriers won the team race from Greenock Wellpark with both tied on 8 points. 1. W Stoddart 4:48:08; 2. J Milne (EAC) 5:04:19; 3. W Russell 5:21:15; 4. R Meadowcroft (Bolton); 5. J McNeill (Shettleston) 5:33:59; 6. D Turner (Pitreavie) 5;39:21; 7. G King (Wellpark) 5:39:51; 8. D Anderson (Wellpark) 6:15:52; 9. R Bradney ((Wolverhampton) 6:16:43; 10. K Mackay (Preston) 6:45:43. 1972: The 12th and final race was held on 21st October. The DB Brooke Trophy (individual) went to Jimmy Milne and the Daily Record Trophy (Team) went to Lochaber AC. John Ballantyne (Springburn) was the early leader up to 20 miles which he passed in 1:58:56 with Milne and Russell together in joint second throughout. Milne then took over from 20, and Ballantyne, after reaching the marathon distance in 2:49, retired. Meantime Milne had opened a gap from Russell. At the finish he won by over 22 minutes. Willie Russell being one of the unlucky runners in this series of races as he wound up runner-up for the second year after placing third in 1970 and fourth in 1969. Support for the race was poor as only eight entered and six finished. The above article was written in August 1978 for inclusion in the October 1978 issue of the SMC Magazine. For various reasons that issue never materialised. Although the article is over five years old I thought members of the SMC would be interested to read of a past club promotion. Back in 1978 we asked club members if they would be interested if the race was revived – only eleven replied in favour – the committee decided to keep the status quo. Times change however and with the current unprecedented interest in marathon and long distance running another picture could now emerge. It took place on Sunday, 3rd June, 1984. the organising club was Sri Chinmoy Athletic Club, Scotland. Their president was the well known Scottish poet, short story writer and novelist Alan Spence; and their treasurer Adrian Stott, a very experienced and popular ultra-distance runner who later in 1999 became British 24 hour champion and as a GB International, eighth in the European event in 2000. The Sri Chinmoy organisation promotes running as a way of self expression and fulfilment. ‘Runners are Smilers.’ Most competitors did not always live up to this motto during this particular event, however, at least until they finished. The route started (to avoid traffic) at 7:00 am from Meadowbank Stadium in Edinburgh and followed the A89 past Broxburn, Bathgate, Airdrie and Baillieston before finishing in George Square, Glasgow. There were sixteen finishers. Don Ritchie of Aberdeen AAC won easily in five hours three minutes 44 seconds. Second was Dave Taylor of Hunters Bog Trotters in 5:24:37; third Colin Youngson, (Aberdeen AAC), in 5:28:15. These were followed by Dave Francis (Fife AC – 5:41:49); Stephen Demepsey (Livingstone – 5:418); Ian Goodwin (Pitreavie – 5:49:57); Robin Thomas (HBT – 5:51:53) and Brian Iddon (Chorley – 5:58:18). 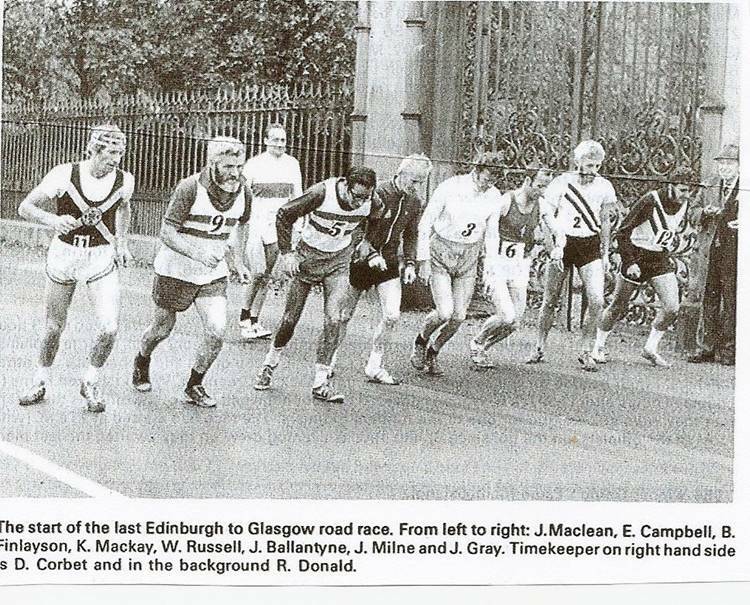 The others were James Zarei, Graham Flatters (Dundee Hawkhill Harriers), Jimmy Shaw, John Taylor (Greenock Wellpark), John Keogh (EAC), John Lannigan (Maryhill Harriers), Bob Meadowcroft and Tim Musson (ESH). Only three starters did not complete the course. Basically Don Ritchie went off with Dave Francis and the reached five miles in 30:03. By ten miles (58:53) Don was almost two minutes clear and he continued to extend his lead remorselessly right to the end. While other fast starters faded, Colin Youngson , who had been seventh at five miles took until almost 20 miles to catch Dave Francis. They stayed together until 30 miles and then Colin moved into second place. However he ran out of steam and had lost more than eight minutes to Dave Taylor by the time they passed 45 miles together. ‘Doive Toiler’ then kept going impressively while Colin struggled in. The weather had been slightly too cool but refreshingly damp and the organisation very efficient indeed. (Colin Youngson adds:) Although I had occasionally tried ultra marathons before with some success (second in the Two Bridges race in 1975 and fourth in 1980, plus a good seventh in the London to Brighton in 1980) I was basically a marathon specialist and had made no particular effort to train hard for this event. It seemed a good challenge however and offered me the opportunity at last to complete Stage 7 of the Edinburgh to Glasgow Relay, the only section I had never raced! Unfortunately I ate some badly chosen Italian food the night before which led to my stomach running faster than my legs. When my old friend Donald suggested that I keep him company for the first ten miles, I politely demurred . If the references to he Stages of the E-G puzzle, then there is a separate section on the Race that will enlighten you.